The unicorn is a leegendar ainimal that haes been descrived syne antiquity as a beast wi a lairge, pyntit, spiralin horn projectin frae its foreheid. The unicorn wis depictit in auncient seals o the Indus Valley Ceevilisation an wis mentioned bi the auncient Greeks in accoonts o naitural history bi various writers, includin Ctesias, Strabo, Pliny the Younger, an Aelian. The Bible an aa describes an ainimal, the re'em, that some versions translate as unicorn. 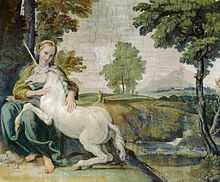 In European fowklair, the unicorn is eften depictit as a white horse-lik or gait-lik ainimal wi a lang horn an cloven huifs (whiles a gait's beard). In the Middle Ages an Renaissance, it wis commonly descrived as an extremely wild widland craitur, a seembol o purity an grace, that coud anly be capturt bi a virgin. In the encyclopaedias its horn wis said tae hae the pouer tae render pushioned watter potable an tae heal sickness. In medieval an Renaissance times, the tusk o the narwhal wis whiles sauld as unicorn horn. Unicorns are nae foond in Greek meethologie, but raither in the accoonts o naitural history, for Greek writers o naitural history war convinced o the reality o unicorns, that thay believed lived in Indie, a distant an fabulous realm for them. The earliest description is frae Ctesias, that in his beuk Indika ("On Indie") descrived them as wild cuddies, fleet o fit, haein a horn a cubit an a hauf (700 mm, 28 inches) in lenth, an coloured white, reid an black. Aristotle maun be follaein Ctesias whan he mentions twa ane-horned ainimals, the oryx (a kynd o antelope) an the sae-cried "Indie cuddie". Strabo says that in the Caucasus thare war ane-horned horse wi stag-lik heids. Pliny the Elder mentions the oryx an an Indian ox (aiblins a rhinoceros) as ane-horned beasts, as weel as "a verra fierce ainimal cried the monoceros that haes the heid o the stag, the feet o the elephant, an the tail o the boar, while the rest o the bouk is lik that o the horse; it maks a deep lawin noise, an haes a single black horn, that projects frae the middle o its foreheid, twa cubits [900 mm, 35 inches] in lenth." In On the Nature of Animals (Περὶ Ζῴων Ἰδιότητος, De natura animalium), Aelian, quotin Ctesias, adds that Indie produces an aa a ane-horned horse (iii. 41; iv. 52), an says (xvi. 20) that the monoceros (Greek: μονόκερως) wis whiles cried cartazonos (Greek: καρτάζωνος), that mey be a form o the Arabic karkadann, meanin "rhinoceros". Youths riding goats (a Dionysiac motif in antiquity) on 12t-century caipitals frae the aibey o Mozac in the Auvergne. The gaits are indistinguishable frae unicorns. Medieval knawledge o the fabulous beast stemmed frae biblical an auncient soorces, an the craitur wis variously representit as a kynd o wild cuddie, gait, or horse. The Throne Chair o Denmark is made o "unicorn horns" – awmaist certainly narwhal tusks. The same material wis uised for ceremonial cups acause the unicorn's horn conteena'd tae be believed tae neutralise pushion, follaein clessical authors. The horn itsel an the substance it wis made o wis cried alicorn, an it wis believed that the horn hauds magical an medicinal properties. The Dens physeecian Ole Worm determined in 1638 that the alleged alicorns war the tusks o narwhals. Sic beliefs war examined wittily an at lenth in 1646 bi Sir Thomas Browne in his Pseudodoxia Epidemica. In heraldry, a unicorn is eften depictit as a horse wi a gait's cluifs an beard, a lion's tail, an a sclender, spiral horn on its foreheid. Whather acause it wis an emblem o the Incarnation or o the flegsome ainimal passions o raw naitur, the unicorn wis nae widely uised in early heraldry, but becam popular frae the 15t century. Tho whilees shawn collared an cheened, that mey be taken as an indication that it haes been tamed or tempered, it is mair uisually shawn collared wi a braken cheen attached, shawin that it haes braken free frae its baund. In heraldry the unicorn is best kent as the seembol o Scotland. The unicorn wis chuisen acause it wis seen as a prood an howtie beast that wad raither dee nor be capturt, juist as Scots wad fecht tae remeen sovereign an unconquered. Twa unicorns supportit the ryal airms o the Keeng o Scots, an syne the 1707 union o Ingland an Scotland, the ryal airms o the Unitit Kinrick hae been supportit bi a unicorn alang wi an Inglis lion. Twa versions o the ryal airms exeest: that uised in Scotland gies mair emphasis tae the Scots elements, placin the unicorn on the left an giein it a croun, whauras the version uised in Ingland an ensewhaur gies the Inglis elements mair prominence. Gowden cunyies kent as the unicorn an hauf-unicorn, baith wi a unicorn on the obverse, war uised in Scotland in the 15t an 16t century. In the same kinrick, cairved unicorns war eften uised as finials on the pillars o Mercat crosses, an denotit that the dounset wis a ryal burgh. Certaint noblemen sic as the Yerl o Kinnoull war gien special permission tae uise the unicorn in thair airms, as an augmentation o honour. The creest for Clan Cunningham beirs a unicorn heid. Hunts for an actual ainimal as the basis o the unicorn meeth, acceptin the conception o writers in Antiquity that it really existit somewhaur at the edge o the kent yird, hae addit a forder layer o meethologisin aboot the unicorn. Thir hae taken various forms, interpretit in a scienteefic, raither nor a wunner-filled manner, tae accord wi modren perceptions o reality. Amang numerous finds o prehistoric banes foond at Unicorn Cave in Germany's Harz Mountains, some war selectit an reconstructit bi the mayor o Magdeburg, Otto Von Guericke, as a unicorn in 1663 (illustration, richt). Guericke's sae-cried unicorn haed anerly twa legs, an wis constructit frae fossil banes o a ooie rhinoceros an a mammoth, wi the horn o a narwhal. The skeleton wis examined bi Gottfried Leibniz, that haed previously doutit the existence o the unicorn, but wis convinced bi it. 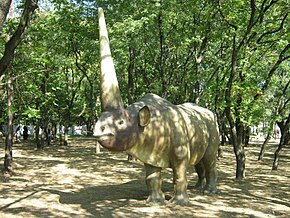 Ane suggestion is that the unicorn is based on the extinct rhinocerus species Elasmotherium, a huge Eurasie mammal native tae the steppes, sooth o the range o the ooie rhinoceros o Ice Age Europe. Elasmotherium leuked a wee bit lik a horse, but it haed a lairge single horn in its foreheid. It becam extinct aboot the same time as the rest o the glacial age megafauna. Houiver, accordin tae the Nordisk familjebok (Nordic Faimilybeuk) an science writer Willy Ley the ainimal mey hae survived lang eneuch tae be remembered in the leegends o the native European fowwks as a huge black bull wi a single horn in the foreheid. ↑ 1.0 1.1 The Encyclopædia Britannica: A Dictionary of Arts, Sciences, Literature and General Information. 27. 1911. p. 581. ↑ Aristotle (c.350 BC). "Book 3. Chapter 2.". On the Parts of Animals (Περι ζώων μορίων). trans. William Ogle. Archived frae the oreeginal on 2008-05-01. ↑ Aristotle (c.343 BC). "Book 2. Chapter 1.". History of Animals (Περί ζώων ιστορίας). trans. D’Arcy Wentworth Thompson. Archived frae the oreeginal on 2007-06-30. ↑ Strabo (before 24 AD). "Book 15. Chapter 1. Section 56.". Geography. ↑ Pliny (77 AD). "Book 8, Chapter 31". Natural History. trans. John Bostock. An aa Book 8, Chapter 30, an Book 11, Chapter 106. ↑ Aelian (220) [circa]. "Book 3. Chapter 41.". On the Nature of Animals (Περὶ Ζῴων Ἰδιότητος, De natura animalium). ↑ Aelian (220) [circa]. "Book 4. Chapter 52.". On the Nature of Animals (Περὶ Ζῴων Ἰδιότητος, De natura animalium). ↑ Aelian (220) [circa]. "Book 16. Chapter 20.". On the Nature of Animals (Περὶ Ζῴων Ἰδιότητος, De natura animalium). ↑ Linda S Godfrey (2009). Mythical creatures. Chelsea House Publishers. p. 28. ISBN 978-0-7910-9394-8. ↑ Browne, Thomas (1646). "Book 3. Chapter 23.". Pseudodoxia Epidemica. ↑ 12.0 12.1 Friar, Stephen (1987). A New Dictionary of Heraldry. London: Alphabooks/A & C Black. pp. 353–354. ISBN 0-906670-44-6. ↑ 13.0 13.1 Nisbet, Alexander (1816). A System of Heraldry. Edinburgh: William Blackwood. ↑ Robin Meadows, "The Unicorn, the Mermaid, and the Centaur" Zoogoer, November–December 2006. This page wis last eeditit on 20 Mairch 2019, at 01:08.